1) I took a one-way taxi to this place (The trek base is situated at a distance of 12 kilometers from Paro main town), simply because I wasn’t sure how long would it take, and the taxi-driver was pressing for a definite answer. Moreover, I am almost all the time a bit too overconfident of my hitch-hiking skills. 2) It is a hot day (Oct the 2nd, 2015), and despite repeated warnings (that the trek ought to be started no later than 8:30am) from my hotel-manager, here I am, looking hopefully at the thick globules of clouds, and that tiny speck, up in the mountains, namely Tiger’s Nest. Please watch this in HD. From the point where the taxi drops you, there is a small line-up of trinket and handcraft traders. The patch of land is a part of pine-forest. This is where one buys the local trekking stick for Nu.50 (if you are taking sticks, which I suggest you do, please be in the know that taking two sticks works out better than one) and also hires a horse if one doesn’t prefer walking the distance. A giant rock serves as the platform on which one stands, to be able to climb on to the horse-back, assisted by the handler. Much amused at the ‘jugaad’ set-up, I walked past it, to the clear patch beyond the mini-market and took some pictures of the view of the monastery. I undertook the entire trek on foot. I ran through the gradual ascent, the steep ascent, the mid-point café, right till the official viewing point of the Tiger’s Nest Monastery where people jostled with each other to take pictures. OK. Let me breathe now. AND take pictures. With another hour to kill (actually, photographers never need to kill anything; they shoot :p ), I focused on soaking the feeling of being at the edge of cliff, of sweat being taken care of by the slightly cool wind, and of seeing Taktsang Monastery so up close. Of earning it all, in every sense of the word. When I reached at the edge of the cliff from where one gets the clear view of the monastery, as well as the area it is perched on, the first thing that hit me was a faint feeling of vertigo. It surprised me that none of the travelogues, reviews, blogs I had read ever talked about this bit. The dizziness is unmistakable; though difficult to say if it is because of the height or the altitude-sickness. Latter, because Tiger’s Nest is perched at a height of 10,000 feet from the sea level. No matter how many times you have seen the images of Tiger’s Nest monastery floating around on various media, when you see it in reality, it is bound to overwhelm you with emotions. It is set at such a precarious location, that you cannot help but wonder what architectural roadblocks must have the people faced while constructing it in the 17th century, and reconstructing it in 1998 after the original one got destroyed in fire. The former used human labour, while the latter used cable car to carry the construction material up to the cliff. The usage of the cable car was discontinued once the re-building work was over. The idea is to earn this auspicious sighting with effort. Just twenty minutes before it was time for the monastery to reopen, I started the last leg of my journey, which is the staircase. There are around 800+ steps. On the way, there is a waterfall that goes underneath a bridge, after which there is the last bend with steep stairs. This is the point where my knees felt locked-of-sorts, but since I could see how close I was, I carried on with the steep staircase. Once I was at the monastery doorstep, I was asked to leave everything inside a locker and keep the keys with me. No camera, phone, or any other gadget is allowed. Once I had submitted everything I had, I was asked to fill my details in a register, which I duly did. The fumes from incense and the chants from inside the monastery calm you down as soon as you take the initial few steps. Inside, there is a cave-like structure next to the butter-lamp room where guru Padmasambhava had meditated. I saw many people turning away from here because the cave is too narrow, and calls for a bit of adventure in the soul to venture. Only one person can go in at a time. I peeped in with skepticism, but even before I could assess the whole thing, a group of students lined up behind me said, “go, go; your turn.” There I was, climbing the planks next moment. It felt like some kind of game. The monastery has several rooms with various kinds of prayers, chanting and mediation sessions going on at most of the times. While exiting the monastery, I saw some students, a monk and tons of laughter. Upon going close, I realized that the challenge was to stand at some distance from a statue and walk up to it to touch the eye, albeit with yours closed. I tried and was way off, and mouthed “fu*k!” to express my disappointment. The monk smiled in return and I squirmed in embarrassment. With this, I exited to collect my belonging from the locker-room. The good part of starting the trek late was, I found most of the temples and shrines with very thin crowd. There was no ‘hurrying’ in the experience, or the process. Once I collected my things from the locker, I met two senior citizens (two friends, who had known each other for forty years) from Kolkata, and their guide called Durga. Latter was a telecom engineer with Bhutan telecom. We got talking because they were curious to see a solo traveller trudging around. I told them I live in Delhi, and Durga informed me that Delhi is where he was trained for his profession. Three of them suggested that I walk with them, and if I find no transport for way back, I hitchhike with them too. I was so grateful! On our way down, I was wondering why would a telecom engineer bother doubling up as a guide (I don’t know if anyone in India would); the pride in his voice was unbelievable! Durga sensed my dilemma, and explained that Bhutanese people are very proud of their country and culture. It gives them immense happiness in showing their guests around. What a wonderful thought! Since he said that he is available to show people around on weekends, I have given his contact number (with his permission) at the end of the post. You need to tell him well in advance for him to be available to take you around. 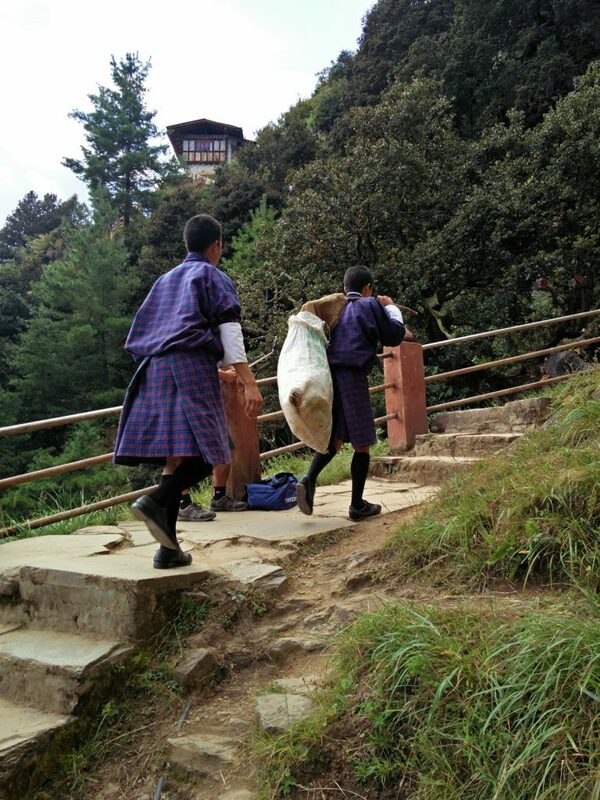 We trekked down with students who carried trash from the monastery to the trash-bins on the way. The sun filtered over Paro beautifully. It drizzled a bit, making the mud track slushy and slowing our pace. By the time we reached the parking, it was almost dark. What was a chirpy place in the morning, now wore a deserted look and had only one car which was Durga’s. Durga, and his two guests dropped me at my hotel, and refused any money in exchange of the favor. Bhutan is a nation that reminds people of a virtue called kindness, repeatedly. 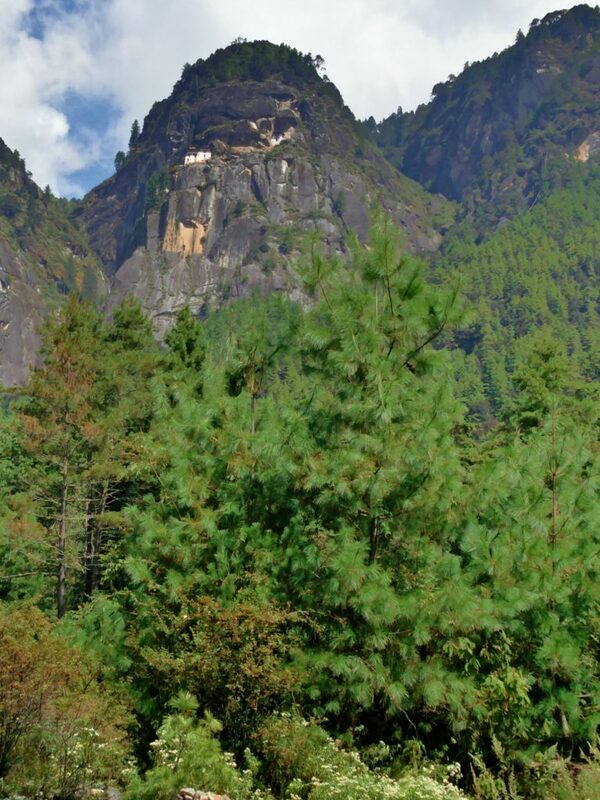 As the history narrates, guru Padmasambhava flew on tigress’ back (an incarnate of Yeshe Tsogyal) to a cave perched on this cliff, where now the Tiger’s Nest sits. The guru has been known to have founded the Mahayana School of Buddhism, and later on purified it to preserve integrity of Buddhist culture. He meditated for three years, three months and three days in this cave, a place which later gained religious importance, and that is how Tiger’s Nest or Taktsang Monastery came into being. b) The side trail: cuts through distances, but eventually works out to be a lot steeper. 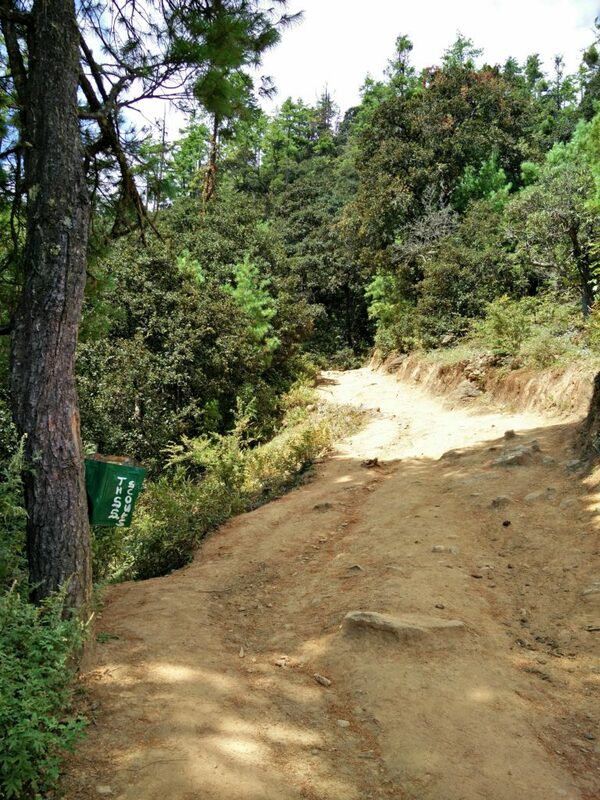 Stick to the main trail unless you are an avid trekker. All through, you will see that the monks take the side trail, and are fairly adept at it. I followed them until I realized I am not, and it was wearing me out. The cafeteria, called the Taktsang Cafeteria, marks the half-way through. After a lunch fit for the kings (yes, that is how expensive it is, with average food), you may proceed further from here. To my utter surprise, I am told that about 30% of the people hike uptill this point only, and no further. You can either trek on foot, or take a horse till here. The viewing-point of Taktsang Monastery: Another 30% treks upto this point only. The Monastery: A handful of tourists, around 40%, finish the whole trek. The prayer flags flapping all around lend a very positive vibe to the whole area. Even the silent stretches (in my case, there were too many; I started late), had them as background music.Tourism in Bhutan for folks from nation other than India, Bangladesh and Maldives works out to be very expensive, which why,it happens very late in the timeline of their life. It is a kind of destination that is associated with niche, selective and affluent class (or an age; which is mostly much later in life, when the bank balance is less wobbly than the knees). A major chunk from this comprises of the 40% that take the trek till the Cafeteria. Should you? Should you not? : If you are travelling to Bhutan, then you must include Tiger’s Nest Monastery in your plan. Altitude-sickness: Tiger’s Nest is perched up at a height of 10,000 ft above the sea-level. I have travelled to places much higher (Lahaul & Spiti), I did not feel any AMS (acute mountain sickness) here, but I could see people grappling with side-effects of high altitude. Acute Mountain Sickness hits a person irrespective of age and/or gender, or the level of fitness. Headache, giddiness, nausea, breathlessness; these are some of the symptoms, and person is advised not to fight the system. Clothing: For hiking, guides normally suggest that you dress up in warm clothes, as the breeze up there is much cooler. I suggest that you do not wear the warm clothes as inner layer, because if you feel warm (which you will, in case you choose to trek), you will be stuck with it. Carry a jacket/pullover, so that it can be removed in case you need to. Please dress up conservatively if you intend to visit the monastery. Footwear: Wear sneakers because at places, the path is too rough, and anything else would wear you out. No boots/ bathroom slippers/sandals/heels etc. Snacks: It is advisable that you carry some snacks, protein bars, chocolates for munching on once in a while; helps immensely in keeping hunger and energy-level in check for the whole duration. Carry a daypack: I cannot stress enough on the importance of this one. Also, if you are a group of people, carry more than one, because lugging one day pack with everyone’s things becomes a pain while ascending. Rain-gear: Carry a rain-coat/umbrella with you, just to be on the safer side. Read the forecast for the day too, but most importantly, listen to the local folks. Weather: If it is not cloudy, start early, because a late start can dehydrate you. Dehydration happens on two accounts; the exhaustion from strenuous activity that trekking is, and the other reason is the over-head sun. Just in case it looks like it might rain unabated, DO NOT attempt the trek. The path is unpaved, and it has the kind of mud that becomes extremely slippery after it rains. Water: Carry a water-bottle, and save yourself from contributing to the trash. Tiger’s Nest has excellent management for recycling the water bottles. People leave behind plastic water bottles, and these are lined up outside the monastery, in a grotto that has free flowing fresh water dripping continuously. You can take a bottle, or if you have one already, you can fill it here; apparently it is the ‘holy water’. 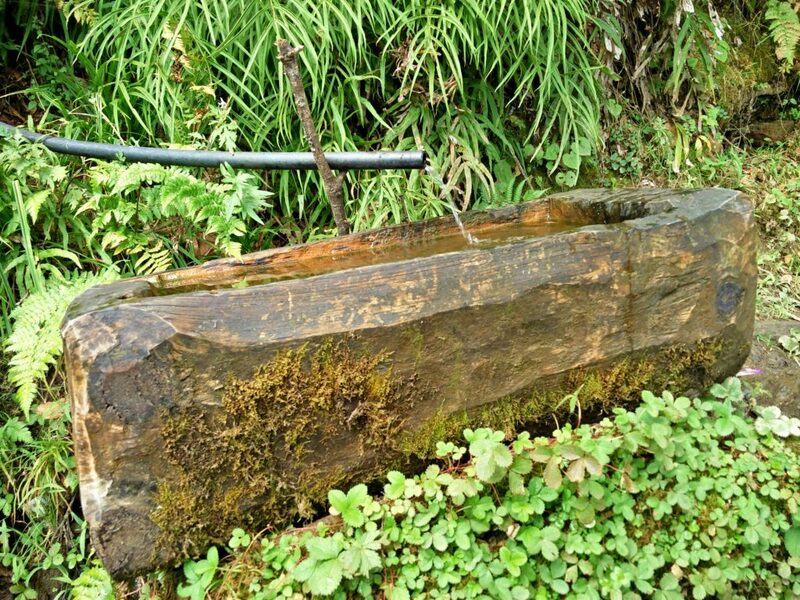 All through the trek, there are various water points with piped water being supplied at these. The monastery has a way to manage wastage left behind by the tourists. 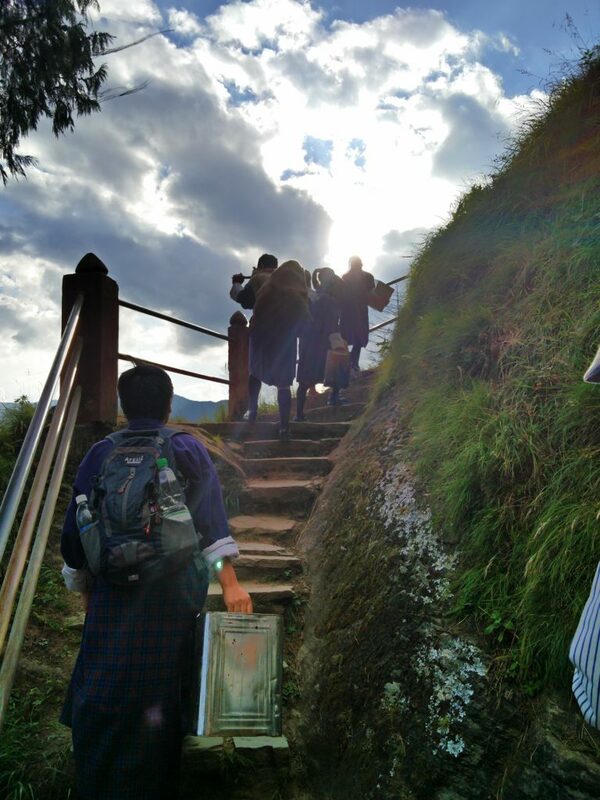 In the evening, the young Buddhist students carry all the trash down to the trash-collection point. Viewing point: As you go up the trail, after every bend the view of monastery levels down a bit (or so it seems), you get a closer view, and it tempts you to stop and take pictures. Several times during the course of the trek, you will be enticed to click pictures of the monastery, or the view of Paro town.Trust me, don’t bother; it will just waste your time. The best view for both comes from the viewing point itself, which is just where the stairs leading to the monastery start. If you are not going right uptill the monastery, then wherever you are going to be turning back from would be the best view for obvious reasons. The biggest nightmare? The Washrooms. Just for this one, I hope Bhutanese authorities are reading this post. One of the living nightmare come true is the restroom facility at the monastery. Looking at the state of the washroom, my pee retracted way up to my esophagus; unbelievably unhygienic and dirty!! Using it is not a choice; with the amount of water one glugs on the way up, one has to. The other alternative is to hold the bladder, for good 6-7 hours. For smokers: I am not a smoker, but two other smoker friends have told me recently, that they did not go all the way up as they were struggling with the trek. It was difficult for them to breathe with ease. Taxi: In case you have a taxi waiting for you, sensible thing to do would be take their phone number and communicate your whereabouts as you descend. In case, you don’t how to get a phone-number in Bhutan, I am assuming you missed reading this post. Lastly, start early, go slow.Happiness! 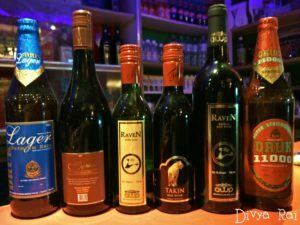 Two bottles later, the pain and the heaviness in my legs gave way to tipsiness in my being, and that was more than welcome! If you want to understand how I felt post the drink, look closely at the font I have watermarked the image with. It is indicative of how the ground beneath my feet felt. Distance between Paro and Tiger’s Nest: 12 kilometers. Trek distance for Tiger’s Nest: 4.5 kilometers one way. Total trek distance: 9 kilometers. One of the moderately easy treks. The trek view is scenic. One of the most gamified monastery experiences. Horses/ponies are available for people might find it difficult to walk all the way. The altitude; it can trigger Acute Mountain Sickness. Mud-track; not recommended for rainy days. Strenuous, if one is physically highly unfit. Very lucid and informative! Creates vivid imagination of the place. Thank you so much, Pallav! Great read. It was almost like I was there on the trip. I admire how to narrate us your trekking experience at the Tiger’s Nest, and how very detailed you are. Your post is a perfect guide for all soon-to-be visitors of this beautiful Tiger’s Nest. Very kind of you to say that. Wow this is really a place to visit! I was really impressed by your story. Watching videos and pictures gives the peacefulness of the area. Yes, Tiger’s Nest is a serene place. Tiger point looks amazing for trekking and the scenic beauty around is just breathtaking! I have always been wanting to go to Bhutan for the great natural treasure this beautiful country possesses. I love how you have captured all the details and it is a complete guide for a trek to Bhutan. Yes, Shubhadrika. This IS a lot of fun; not to be missed. So terribly envious of you! This is definitively one of our bucket list ! Great Great guide, will keep it for our journey there when we plan it! May the luck be with you in planning this for yourself, Thyumi. This is unbelievable. So informative but also so illustrative in your photography. I cannot believe how high up that monastery was – on the edge of a cliff! Gorgeous scenery and fantastic tips in this post. Incredible images.This place is very beautiful thank you for sharing your experience.Each time I read a blog post my Bucket List grows. Divya, that is an amazing trek. The views itself make it so awesome . I hope that some day I can do this for myself and experience it all. Those were some crazy wind sounds in your video. It is wonder you did not fly off, 🙂 Beautiful pictures, especially that of the monastery nestled amidst the hills. Of course you must, if you can manage time for it. Feel free to ask in case you have doubts. I have always wanted to visit this monastery, since the moment I have seen the first photos with it in a National Geographic magazine probably. I do hike quite a lot at home and I enjoy it, so I will probably get the same steady pace all the way up. One should always have altitude sickness pills when hiking a high mountain. Otherwise, the solution is to get down, fast. I agree with you whole heartedly Joannna, because if one is not prepared to deal with altitude sickness, there is no option but to get to a comfortable altitude as soon as possible. I’ve seen the pictures of monastery many times but was not aware of the waterfall in mid of the trek path, its quite refreshing. Your journey was interesting and yes on such places tourism deptt. should take care of hygiene, its a must desired need specially for female travelers. Hey Priyanka, I agree. I hope they do make note of this. Your photos are fantastic. I’ve never seen anything like the Tiger’s Nest. And how funny that you ran into two different old couples who gave you such different pieces of advice! Oooh this place looks great, another one added to the list then! What a thorough and helpful list of advice for visiting the Tiger’s Nest! It seems to me that the 12km hike back to town should not be too bad, since presumably it is down hill? regardless, what a worthwhile way to spend a day! sorry if this bit did not come across in the post- 12 km way back is plains; after trekking down from Tiger’s Nest. Hi, ur description was very accurate in every minute detail. It would be more informative if u coul add details of all the temples inside n their significance. Perfect guide. Inside the temple, electronic equipment were not allowed, so I have no visual of the same to explain. Thank you Divya….planning to visit Tiger’s Nest this October and hence checking net at random for tips and to understand the difficulty level! From your post it appears most probably me and my friend will be able to make it. If not till the monastery at least till the cafe or the the view point. Thank you. You ought to be able to go beyond as well. Trekking is a mind-game; as long as you don’t set limits, you can go anywhere (barring health issues). Do visit DZUKOU valley at Nagaland. U will love it. Best trekking time is from August to October. Hi Divya! I absolutely love reading your posts and by far, the Bhutan posts are my favorite. I’m planning a solo trip to Bhutan, and I was wondering if you could tell me more about the expenses part of the trip(the shoe-string budget line caught by eye :p). Also, would you recommend the flight to Paro or traveling by land? Would it better if I rent a car and drive myself around instead if taking cabs or hitchhiking? I was planning on going to Bhutan in March/April 2018 so I want to get things in order well in advance. I did it in Rs.7K in 7 days. Flight to Paro is an experience which is totally different from travelling overlands; both can’t be compared. I don’t know if self-drive is an option in Bhutan; where did you get that from? IF yes, though it might work out more expensive it ought to be worth it. We are planning a trip to Bhutan from Kolkata.Can you help us with your experiences? It seems like, more than half of the trek I have already experienced by reading your post and the remaining one I’ll experience with Durga, hopefully 🙂 Appreciate your effort in compiling and presenting all the details. Very nice write up! Well written.. Makes you crave for the visit to the place… On my wish list now….